Soon, the stretch of the Hudson River below Hudson Falls, New York, 50 miles north of Albany, will see dredging barges again. The Champlain Canal, which needs to be opened to give dredging barges access, reopened Sunday, May 22, after a three-week delay because of flooding. That means the second stage of dredging, following the first phase two years ago, is scheduled to resume this week if conditions are right. Because the river flow has to reach safe speeds before workers can begin, the start date is re-evaluated each day. It’s not as though dredging goes without a hitch even under the best of circumstances, however. “Sometimes it’s presented that it’s pretty straightforward: ‘It’s 40 miles. Just clean it up,’ ” says Todd Bridges of the U.S. Army Corps of Engineers in Mississippi and a member of the independent panel that reviewed the dredging done in 2009. “These projects are nowhere near this simple.” The project encountered numerous problems and while they didn’t stop the project, they were a reminder than it would not be a quick and easy one. That will mean the second phase runs differently than the first. General Electric, which for decades operated two large riverfront factories that leaked fluids with toxic PCBs into the Hudson, completed the first phase of the dredging project in November 2009. The project’s goal is to remove 2.65 million cubic yards of sediment laced with PCBs, or polychlorinated biphenyls, from the river’s bottom. The first round took place over eight months, after which GE and the U.S. Environmental Protection Agency assembled all of their data on the process — from timesheets to drinking water analyses to levels of PCBs in fish — and presented it to an independent review board for evaluation. The board’s verdict, delivered in August 2010, was not a favorable one. Prior to dredging, the EPA and GE had set standards for how much PCB-contaminated sediment should be dredged, how much contamination would be allowed to remain on the river’s bottom, and how much could reenter the water during the dredging process. The board concluded that none of the standards was met. GE only dredged 10 out of the 18 scheduled sites, left more PCBs in the riverbed than planned and, in the process, kicked up more PCBs into the water than anticipated. In those few months of the dredging, complex issues arose along with the sludge. At most of the sites, PCBs were buried deeper in the mud than earlier tests had revealed. Beneath years of piled debris, the hidden chemicals forced testers to take new measurements, and because there were more PCBs than expected, it took longer to remove them. “We would expect to be further down the river,” says Larisa Romanowski, a community involvement coordinator for the EPA. With each extra day and each extra bucket load, more chemicals escaped into the river. General Electric spent $561 million on the first phase alone, which included construction costs, and a total of $831 million so far on the entire project. The final cost will be in excess of one billion dollars, the EPA says. GE is not releasing an estimate for the upcoming year. General Electric released PCBs into the northern Hudson River for over three decades, beginning in the 1940s. The company used PCBs as an insulator in electrical capacitors produced in its plants in Hudson Falls and Fort Edward, about an hour’s drive north of Albany, New York. PCBs are a group of organic molecules now labeled probable human carcinogens, with additional toxic effects on the immune, reproductive, nervous, and endocrine systems. In 1976, the New York Department of Environmental Conservation banned fishing in the upper Hudson due to these health concerns. Eight years later, in 1984, the EPA declared the 200-mile stretch downriver from the two plants to be a federal Superfund site, one of the largest of the more than four hundred sites on the original list of the country’s most hazardous waste dumps. But it wasn’t until 2000 that the EPA proposed a plan for dredging the contaminated sediment from the Hudson and moving it to a new location. Until then, General Electric had capped contamination sites amidst much debate over how to deal with PCBs that were tethered to river sediment and infiltrating the water column. ‘Capping’ entails covering up the sediment with new, clean mud, as well as rocks and gravel. Many weren’t happy with this cover-up job. “Five hundred pounds of PCBs go over the Troy dam [in one year], so we really need to get them out,” says Dave King, a projects coordinator at the EPA. After years of planning and legal battles, General Electric finally began to dredge in May of 2009, moving the toxic sediment to a location in Texas. The biggest surprise from the initial year of dredging was just how deep the PCBs were buried in the river sediments. 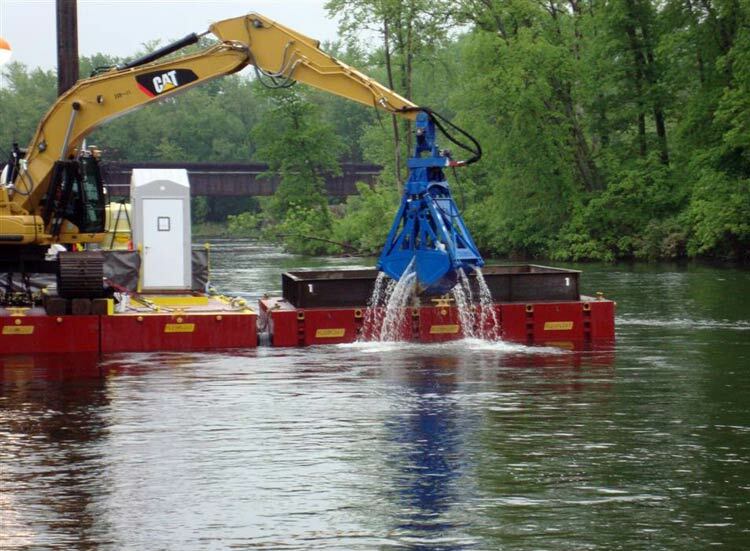 Engineers rely on sediment cores to find out how far down PCBs reside in the river’s bed, and therefore how far down the clamshell bucket of a dredging barge needs to scoop. They drill a hollow tube with a three-inch diameter into the ground, let it fill with muck and then pull it back up to the surface. Evaluators slice up the cores, which are taken at locations 80 feet apart, and then measure PCB levels. Based on those results, they tell the dredgers how deep they need to dig at each site. General Electric took 50,000 core samples. But in almost 70 percent of the sites, the required depth to reach all the PCBs turned out to be at least six inches greater than the core samples had suggested. The key reason was debris. Wood from logging and sawmills of yesteryear had piled up on the river’s bottom. There were also remains of structures, such as the foundations of British forts. When the drill to get sediment samples hit the faux floor, operators incorrectly assumed it was as far as they could go. Later, when GE contractors pulled up the one to three feet of debris that had stopped the drills, they found that the PCB contamination continued below. This meant that they had to dredge deeper and longer than anticipated in many sites. For the forthcoming phase of dredging, GE contractors took a new set of core samples, but this time with a sonic drill, according to the EPA’s King. A sonic drill, which vibrates while drilling, cuts through the debris that’s in the way. “You get a much better picture,” says King, but adds that because of statistical uncertainty, they will dig deeper than proposed anyway. This year, there will be just five dredging platforms in the water at a time, instead of twelve. GE and the EPA hope that having fewer buckets in the river at once will reduce the amount of PCBs kicked up into the water. Each of these stations will be more efficient, in part because of more accurate readings of where and how deep the PCBs lie. Instead of using the river’s bottom as a benchmark for the depth of contamination, new calculations are based on elevations. Since the bottom of the river changes from year to year as more material piles up in the winter, depths taken earlier may not be accurate. Elevations don’t fluctuate and will reduce uncertainties in how far down the PCBs really lie. The amount of loose PCBs floating in the river water has also turned out to be a bigger issue then anticipated. The problem is that PCBs can attach themselves, in solid form, to the sediment, but they also take the form of a dissolved liquid or a volatile gas. Some of the kicked-up sediment that escaped the dredging buckets eventually settled back to the floor downstream from the dredging sites, where future dredging will take place anyway. At the dredging sites, though, approximately 80 percent of the targeted PCBs were found in the water column, an unexpectedly high percentage. And a problematic one because once the PCBs are in the dissolved phase, there’s not much that can be done, says King. As the project is designed, dredging should remove 97 percent of the contamination in specified sites, says GE. These sites, however, only account for a small fraction of the polluted area. The Superfund site is 200 miles long, while the dredging project only targets the most contaminated sites within the 40 miles directly downstream from GE’s plants. Advocates for an unpolluted Hudson, such as Scenic Hudson’s Mullarkey, would like a more thorough cleaning than GE is doing, but she is satisfied with how the project is going so far. “It took 37 years to even get them to dredge,” she says, “so we’re really happy that they’re at this point and are continuing it.” GE was not under legal obligation to dredge.